Crowds of people hold signs on Pennsylvania Avenue at the "March for Our Lives" rally in support of stricter gun control, March 24, 2018, in Washington. "Fight for your lives," a high school student urged the crowd Saturday in Washington at the March For Our Lives demonstration. Emma Gonzales has emerged as one of the most outspoken student leaders from the Marjory Stoneman Douglas High School in Parkland, Florida, where a shooter killed 17 people last month. Gonzales and other students from the Florida high school organized the demonstration in Washington to rally for stricter gun laws. More than 800 sister marches were held in other U.S. cities and around the world. The mass shooting at the Florida school has sparked outrage and political activism among young people across the U.S.
During Gonzales' address to the crowd, at one point she stood silently for six minutes and 20 seconds, the time it took for the gunman to kill the 17 people at her school. Then she said, "The shooter has ceased shooting and will soon abandon his rifle, blend in with the students as they escape, and walk free for an hour before arrest. Fight for your lives before it's someone else's job." On Facebook Saturday morning, the National Rifle Association (NRA) which has consistently opposed stricter gun laws posted a message: "Today's protests aren't spontaneous. Gun-hating billionaires and Hollywood elites are manipulating and exploiting children as part of their plans to DESTROY the Second Amendment and strip us of our right to defend ourselves and our loved ones." In Atlanta, Georgia, tens of thousands of people -- including more students from Parkland -- marched carrying signs saying "Protect Kids, Not Guns," and "Vote Them Out." Civil rights leader and U.S. Representative John Lewis marched, too, wearing a large red letter "F" pinned to his clothes. He said it was the grade -- on a scale of A to F -- that the NRA gave him for supporting gun control. Atlanta Mayor Keisha Lance Bottoms and several members of the state Legislature also attended the Atlanta rally. In New York City, former Beatles member Paul McCartney attended the rally, telling CNN, “One of my best friends was killed in gun violence right around here, so it’s important to me.” McCartney was referring to his former bandmate John Lennon, who was shot to death in 1980 outside his New York City apartment building. The Brady Campaign to Prevent Gun Violence said in a statement: "The sight of patriots in Washington, D.C. and across the country speaking out for change was more than inspiring. It was a sign that there has never been more energy and urgency behind the demand for sensible reform." However, the gun control marches were met in some places with objectors. A man who wanted to be identified only as “Joe” from upstate New York spoke to VOA in front of the Trump International Hotel, just blocks from the White House. Hundreds of gun enthusiasts marched in Salt Lake City Saturday, calling for better protections for schools and for arming teachers. They turned up in Phoenix, Arizona, as well, challenging the gun-control activists to debate the issue. President Donald Trump, who has not commented on Saturday’s demonstrations, is spending the weekend at his vacation home in Florida, less than an hour’s drive from Marjory Stoneman Douglas High School. 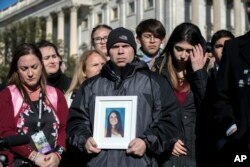 Ilan Alhadeff, joined at left by his wife, Lori, holds a photograph of their daughter, Alyssa Alhadeff, 14, who was killed at Marjory Stoneman Douglas High School in Parkland, Fla., during a rally by lawmakers and student activists in support of gun control. Hundreds of protesters in Palm Beach lined up along the route Trump’s motorcade usually takes from his golf club to his vacation home, Mar-a-Lago, on Saturday. But his motorcade took a detour, avoiding the demonstrators. The Palm Beach Post reports the detour also avoided a large billboard installed along the motorcade route last week that calls for the president’s impeachment. A new poll conducted by the Associated Press-NORC Center for Public Affairs Research reveals that nearly half of Americans do not expect their politicians to change gun laws. The poll also found, however, that 69 percent of Americans surveyed thought gun laws should be tightened, up from 61 percent in in October 2016 and 55 percent in October 2013. Overall, the survey indicated 90 percent of Democrats, 50 percent of Republicans and 54 percent of gun owners favored stricter gun control laws. What Is the National Rifle Association?